Shakespeare's Sonnets have caused endless debate and speculation: who is the dark lady, who is the 'only begetter'; and what light do the poems shed on the life of the poet? Yet the sonnets themselves can be enjoyed for their lyricism rather than their intention. 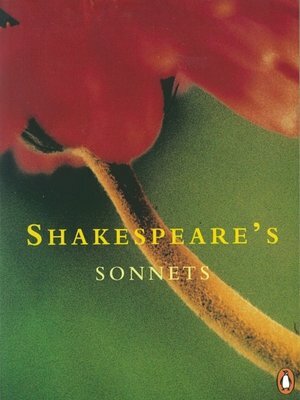 Written as a form of personal confession - of love, of grief, of anger, of jealousy and of lust - the sonnets encompass a huge range of human emotion beautifully expressed within the restrictions of the form. Some, such as 'Shall I compare thee to a summer's day' or 'Let me not to the marriage of true minds' will be instantly familiar to readers, while others, equally rich in imagery, are less well known. Together they form a powerful meditation on the nature of love, marriage, beauty and time. William Shakespeare was an English poet and playwright of the 16th and 17 centuries, now widely regarded as the greatest writer in the English language and the word's pre-eminent dramatist.